Splatoon 2, like its predecessor, looks like utter trash. I know that there are plenty of others that like the try-hard childpunk attitude with its nauseating overuse of sickeningly bright, clashing, “street” colours, but I don’t. Perhaps I’m old, and perhaps I just don’t get what passes for attractive aesthetics among kids these days, but I just don’t care. It’s an ugly, ugly, ugly game, and on the back of Arms I’m less than pleased that Nintendo appears to be apply this art direction to all of its new IPs now. Related reading: Matt's review of the first Splatoon. However, Splatoon 2 isn't Arms. With Arms there wasn’t nearly enough to the game itself for me to move past my distaste for the aesthetics. With Splatoon, there is. In fact I must have spent a hundred hours playing the original, and it was one of the highlights on the Nintendo Wii U. As such, I was looking forward to the sequel on the Switch, especially since it meant that, as I play the Switch as a handheld console, I’d be able to kick back in bed for a couple of rounds at night, which is exactly how I want to play this kind of game. Unfortunately, Nintendo knows all too well that very few people actually bought the Wii U, so it can get away with minimal updates to the games it released on that console. Mario Kart 8, for example, is a straight port, though the addition of the battle mode made that one the ultimate version of a very good game. 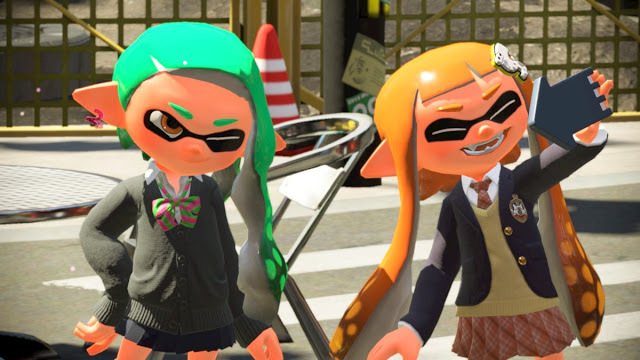 The additions to Splatoon 2 are far more minimal, and aside from the addition of a horde mode, which behaves more than a tutorial than something to really get stuck into, Splatoon 2 barely deserves to be considered a sequel. 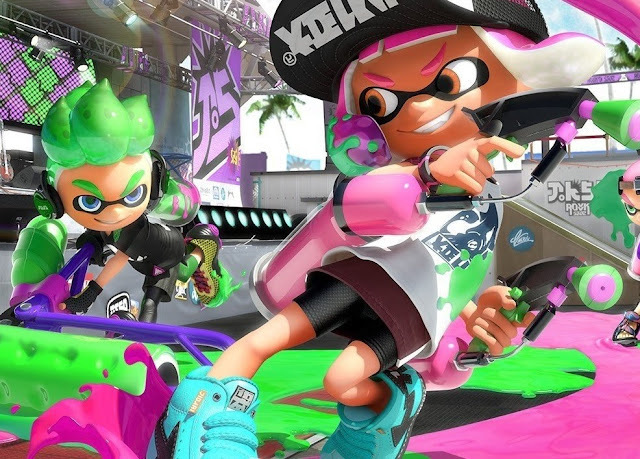 For those who missed the Wii U release, Splatoon is Nintendo’s take on a competitive shooter. Being Nintendo, this means it’s less violent than a beating with a feather duster, replacing guns and blood with water pistols and paint. The goal in the main game is to cover as much of a level as possible with paint, shot out of your guns, while working in teams that are split into four each side. 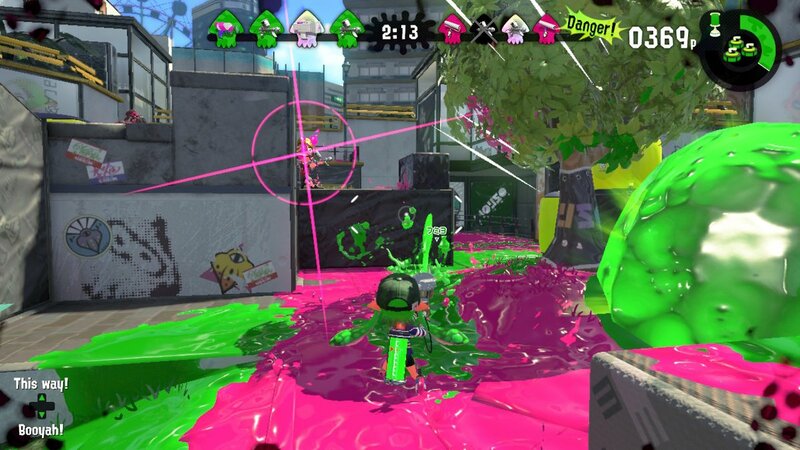 Doing well at Splatoon involves shooting opponents with enough paint that they go splat and are temporarily taken out of the action, but it also involves running around the level coating any surface with your team’s ink. And, of course, you can also paint over another team’s ink, thus “capturing” their land. Levels are just a couple of minutes in length, and with the overwhelming bulk of the game occupied with variations on this, you'll be doing this exact thing over and over and over again until you’re ready to give it a break and play something else. What’s lovely about the game is that it’s a shooter in which communication with other players is not necessary to be good and have a good time. It means you have to put up with none of the juvenile nonsense that people excuse as 'trash talk' in other competitive games. After a few rounds you’ll get a feel for how the game’s simple team strategies work (effectively, split up and do your own thing, but keep an eye out for opportunities to help out a teammate), and each level is so short and chaotic that it’s not a stressful experience by any means. Losing has no substantial consequences, and winning’s simply an excuse to play another round. Without trying to sound too boastful, I’m always in the top two players of my team, whether we’re on the winning or losing side (hey, I have been playing the two games for dozens of hours now, I should be good), but I’ve never really felt like I’ve been let down or hindered by my team. It’s just not a competitive enough experience for me to care. Unless you want to get competitive, of course. Nintendo’s included all the necessary features to make for an incredibly competitive game, with ranked matches and the like, and in building on the success of the first Splatoon, there’s the right infrastructure there to make this a decent eSports title. The new game includes a few new maps for even greater variety (and the good news is that each one is subtly different and requires slightly different strategies), and a few new weapons to increase the metagame balancing. Speaking of balance, the weapons in Splatoon 2 are a fun bunch, ranging from riffs on the long range sniper rifle, to melee-orientated weapons, shotguns, pistols and machine guns. As I was playing I never felt like any of the weapons were unbalanced or unfair, and while I definitely preferred playing with the dual pistols, I was also able to mess around with the other weapons if I wanted a change of pace without feeling out of my depth. What really lets the game down is the matchmaking. Splatoon doesn’t seem to care about pairing new players (with “experience” levels of 1 through to 4) with veterans of level 10, 15 or higher. It does lock away the ranked modes until you’ve hit a minimum level of experience (level 10 or higher), but it’s got to be intimidating for lower level players to come into a regular match with people with that much greater experience. 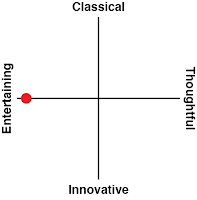 Not that the experienced players are necessarily good, but the perception is still there. Worse, when the full complement of eight players is found and everyone’s thrown into a match together, the teams are randomised, and over and over again I found myself on a team where the most experienced player was still of a lower level than any single player on the other side. 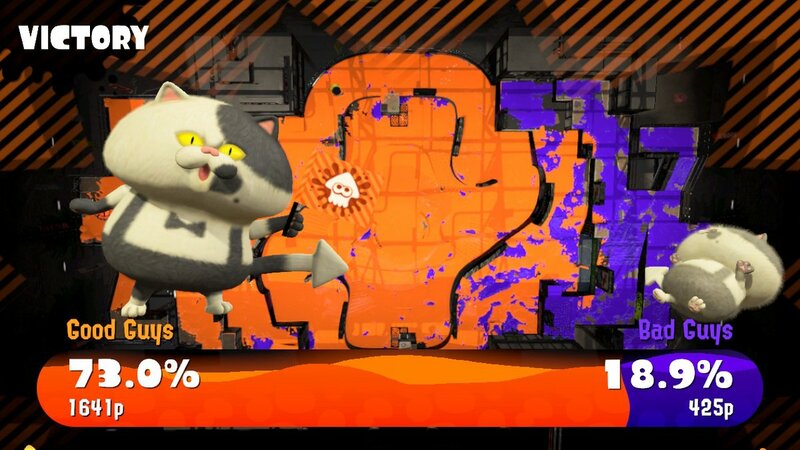 I’m not sure if the system takes form into account, because there were plenty of times my team would still win under such circumstances (led mightily by yours truly, of course), but again, the perception is that the matchmaking is poor. The only major addition to Splatoon 2 (other than a new story mode which just isn’t worth playing at all), is Salmon Run, Nintendo’s take on a horde mode. In this mode you’ll be working together with three other players, fending off hordes of enemies, defeating seven different kinds of bosses, and then taking the loot from those bosses back to a central base. Do that successfully over a number of waves and you win. 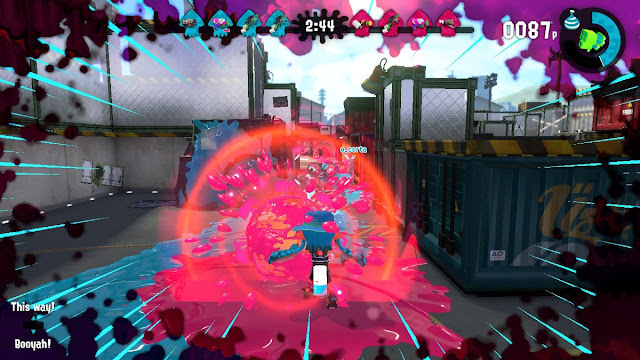 The best feature about this mode is that with every wave, you’re forced to use a randomised weapon, which means that you have the opportunity to use this relatively low-pressure game mode to become comfortable with weapons that you don't normally use in the competitive modes. I know I only discovered that dual pistols were to be my main after using them a couple of times in Salmon Run. On the downside, the variety in this mode isn’t great. I prefer when my horde modes have tower defence elements to introduce a bit of strategy into the mix, but the strategy in this game is overbearingly simple. It’s also far too easy for far too long. Even when one jerk player leaves the game midway through, it’s comfortably easy to emerge from the final wave victorious with three characters, and this is in no small part because none of the bosses are even remotely interesting in their attack patterns. Sadly, there are all kinds of in-game rewards tied to Salmon Run, or substantially easier to earn by playing this mode, and eventually it becomes an obnoxious grind. Finally, and I know this is petty, but it just dampens the experience ever so slightly; the Wii U Splatoon original had a simple, but very enjoyable little arcade game to play while you were waiting for a group of eight to form for a match. That minigame is gone with the Switch sequel, and it’s irritating. There’s nothing that bores me more about online multiplayer games than sitting and staring at a screen as you wait for a group to form. At the moment it’s not so bad because everyone with a Switch is playing the game, but as the community settles down those wait times are going to get longer and longer. The removal of that minigame such a minor thing, but a disappointment nonetheless. Nintendo has taken one of the few genuine highlights that it enjoyed with the Wii U and successfully brought it to the Switch and, one suspects, a new audience to go with the old. The new game plays like a dream and is the same excellent, balanced, and replayable game that we all remember, while the addition of a horde mode shows that at least Nintendo is thinking. But calling the rest of the game a “sequel,” might be a bit of a push. “Enhanced port,” would be far more accurate. I don't mean that as a criticism, though, because Nintendo achieved something so refined and playable the first time around that there wasn't much reason to mess with the formula here. So it's probably just for the best that we're getting the same game with only the most minor enhancements, which don't mess up what was already there in the slightest. 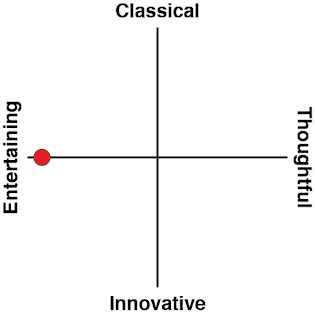 But I really, truly hate the art direction. Splatoon is ugly.